As someone who lives in Amsterdam, I don’t enjoy the crowds, tourist shops, loudness, and overpriced food. Sure, the museums and a lot of sites are clustered in the Centre. If you’re interested seeing real Amsterdam, I recommend leaving Centre. Otherwise, you lose out on getting an opportunity to experience Dutch culture in local neighborhoods with far better food and cheaper drinks. By staying in some of the areas mentioned in this post, you’ll be able to save money by having access to cheaper food, more supermarkets, laundromats, and most other conveniences that you would expect in any neighborhood. One of traveling anywhere is exploring neighborhoods that are very distinct from each other, seeing how people actually live (not how it’s packaged to tourists), and scouting out the local favorites. I specially picked neighborhoods a short walking/biking distance from the major sights to make it easier to see the big attractions. Although some areas have a higher concentration of hotels (like the Jordaan), a lot of the areas mentioned aren’t as touristic, so you’ll have better luck looking on Airbnb for a reasonable room. In terms of transport, it’s typically fastest to bike anywhere, so I suggest renting a bike. For the record, almost everyone here in Amsterdam speaks English, so you’ll have no problems. For quintessential Amsterdam, the Jordaan is far from a well-kept secret as it is picturesque and close to the Anne Frank House. Despite many tourists passing through, the Jordaan is still quiet, residential, and charming. Best Streets to wander: Willemstraat and Lindengracht. Brown Bars, which are traditional old Dutch bars that are covered in wood. Typically, the beer selection can be a bit limited, but you can always get a good coffee or verse muntthee (fresh mint tea). You’ll find nuts, beer, tea, and sometimes homemade cake. I especially love Cafe Papeneiland, one of Amsterdam’s oldest and most beautiful brown bars. There are two levels and you’ll feel transported back in time. Lindengracht & Noordermarkt weekend markets for local goods & fresh food. For an affordable room in a nice setting, consider booking a room at Max Brown Hotel Canal District. For something unique, stay at the Pulitzer Amsterdam, a five star hotel composed of twenty canal houses. For the luxury experience, book a room at The Dylan Amsterdam to experience old world charm combined with new amenities. You’ll not find that many hotels in this area as it’s mostly residential, however there’s also apartment rentals in the Jordaan for those with bigger groups. As there’s not that many hotels in de Jordaan, book early as they go quickly. Book your accommodation in the Jordaan now! Food: While in Amsterdam, try Indonesian AND Surinamese food. Finding both out of their respective countries is quite difficult outside of the Netherlands, but you’ll find them to be incredibly delicious, different than Dutch food, and inexpensive (if you’re not doing rijsttafel!). Click to read about Dutch food. For the best Indonesian in the Jordaan: “Manis” or Eethuis Pondok Indah allows you to pick from what seems like a million different options to make a memorable meal that I love to bring visitors to. Click for my favorite restaurants! 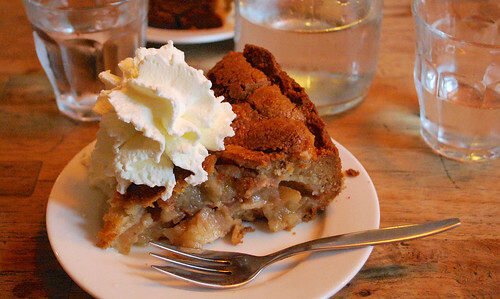 Winkel 43 has the best apple pie in Amsterdam. 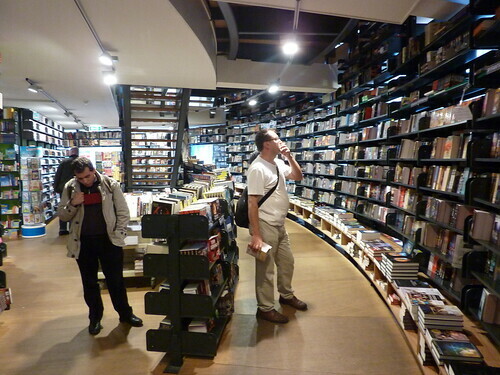 Book stores @ Spui; American Book Centre is the best bookstore in Europe for English-language books outside of England. If you’re close to Centraal and the Jordan, Haarlemmerstraat is a great street to explore with lots of historic architecture. It’s an easy 20 minute walk from Centraal Station, however you’ll be surrounded by cute specialty shops and great food options. Last year, it was named Amsterdam’s Best Shopping Street. If the weather is good, a picnic in Westerpark can be a great way to spend a day or night with friends. Accommodation closer to Westerpark is quite reasonable! Shopping/Sites: For warm hats, scarves, and gloves, visit Bart’s for nice souvenirs/gifts. For Art Deco lovers, The Movies is a dream dating back to the 1930s. It’s Amsterdam’s oldest functional movie theatre. For those on a budget, Marbles Vintage is a good place to go for thrift shopping with carefully picked items curated by theme/color/etc. Be sure to stop by the Turkish travel shop for the friendliest cats in Amsterdam. For foodies, de culinaire werkplaats is worthwhile. It’s a 5 course sustainable dining vegan art/dining experience with a different menu each month. You must make reservations ahead of time. Vesper Bar has delicious, one of a kind, specialty cocktails. I have yet to repeat the same drink. For cheese lovers, Kaasland is a lot of fun, with a selection for the lactose-intolerant. For coffee, Two for Joy is where to go for a cup of coffee. For a more wild night, visit the Soviet-inspired Checkpoint Charlie. This area borders the Westelijke Eilanden, which is full of scenic canals with quite a few hotels. I recommend staying at Yays Boutique Apartments on Bickersgracht for scenic apartments along a quieter canal of Amsterdam. Hotel Teun is a good budget option for those seeking a quieter place to stay although be warned that the rooms are on the smaller side. For those seeking a more modern option, consider Room Mate Aitana for reasonable rooms in a design hotel along the water. Book your accommodation in Amsterdam now! If you walk by the Turkish travel agency, you’ll see the owner’s two beautiful shop cats who live there. Amsterdam’s trendy area with lots of boutique shops and the largest market in Amsterdam (Albert Cuyp market). You’re still walking distance from Vondelpark and the Museumplein although the many eating options should impress the pickiest eater. I’m also a fan of Bazaar for Middle-eastern food with huge portions. You’ll also find a secret bar at the Butcher. De Pijp is starting to explode with great accomodation options for all budgets. For those on a tight budget, consider staying at Cocomama, a boutique hostel with a friendly cat. For those seeking the full B&B experience, stay at Anna’s. For those looking for an affordable room (and no shared bathroom), the Arcade Hotel or Nine(T)Teen is your best bet. For a luxury hotel, look no further than Sir Albert Hotel or Hotel Okura. Book your accommodation in De Pijp now! For anyone who wants to see a more modern area, come to Noord. 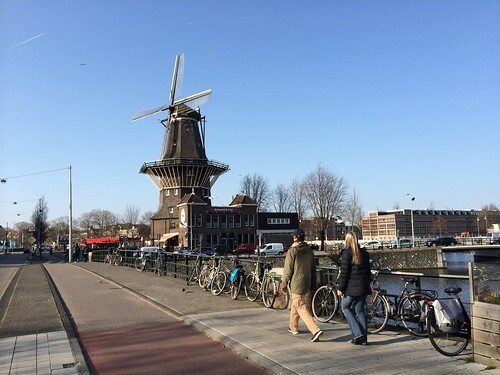 It’s only a 5-10 minute free ferry away from Centraal and you’ll quickly see the comparisons to Brooklyn. It has Amsterdam’s monthly flea market, modern cafes, and outdoor bars where you can eat inside of old shipping containers. IJHallen Monthly Flea Market once monthly. It’s mostly clothes, books, and furniture, but you never know! For beer lovers, Oedipus Brewery is a great place to listen to live music and try some interesting local brews. Pllek is a cafe made out of shipping containers with a great view. Noorderlicht Cafe has a nice beer selection and great food. In September, you can visit Sunflower Maze to get lost in rows of sunflowers. For the budget traveler, consider staying at ClinkNoord. This modern design hostel is a favorite among young travelers looking to get off the beaten path. For the no-frills traveler, stay on a boat at the Botel. For a standard hotel with a twist, you can stay at the Sir Adam, a trendy hotel in the same building as the A’DAM swing. For the ultimate luxury experience, stay in a two story apartment in the middle of a crane at Crane Hotel Faralda. Book your accommodation in Amsterdam Noord now! Despite being close to the museums, you’ll find a lot of great food in this area. 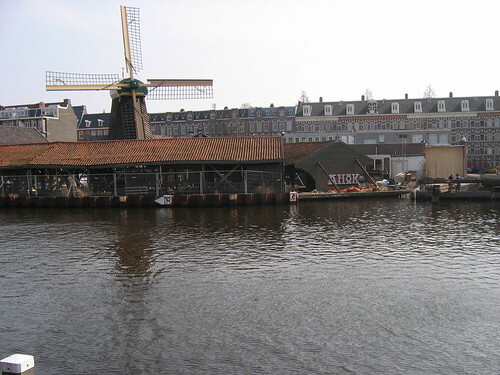 If you”re into windmills, you can see the historic “De Otter” from the canal. Otherwise, you can wander into the many shops and restaurants rapidly opening on Bilderdijkstraat. I often come to this area to eat/drink. This area gets quite busy after 5pm on Fridays. Food/Drinks: For lots of great options, the FoodHallen will allow you try Dutch food, International Food, and drinks from many stalls within one building. For Authentic Greek food, visit To Ouzeri and watch the owners cook. For tapas Slavic-style, go to Foodism for a surprising meal. For Moroccan food, Biladi is a steal with huge portions in a nice setting. My favorite place to relax in Amsterdam is Bridge Schaakcafe “2 Klaveren” where you can play board games while drinking beer. Rotisserie is my go-to for interesting/delicious Gin & Tonics. If you’re on a budget, stay at StayOkay Vondelpark for a clean, modern hostel in a central setting. For those looking for something different, consider De Hallen for a quirky hotel built in a former industrial building with art deco decor or CityHub for a fresh take on hotel rooms with modules. For a boutique hotel with affordable prices, consider the modern Conscious Hotel at Tire Station. On the higher-end, consider staying at the 4* boutique Hotel Vondel for a comfortable stay or the 5* Amsterdam Marriott. Book your accommodation in Old West now! Although tourists rarely see Oost, it’s quite close to Centre and full of great food from all over the world. You’ll find the Dappermarkt for everything you never thought you needed–but need. For a great selection of local beers from all over the Netherlands, visit the BierTuin. Oost is a great area to stay in for modern accommodation while still having access to Center on foot. My favorite Surinamese food to date is Lalla Rookh, with Surinamese food. For those on a budget, the Generator Hostel is your best bet. This boutique hostel is a well-known chain in Europe with lots of extras.For a mid-range option, consider the Student Hotel for a no-frills, comfortable stay. If you’re looking for an extraordinary experience, stay at the Breiter House, a 5* worthy luxury apartment, in an original canal house with the historic atmosphere that you’d expect in a museum. Book your accommodation in Oost now! Do you try to stay in residential areas when you travel and if you’ve visited Amsterdam, what’s your favorite neighborhood? Oh Karen, how I wish I had your insights before our last Amsterdam visit! We stumbled around and enjoyed a few gems you mention here, but for the most part we were just “off”. Discovered Il Pacioccone in the Red Wine District and had a great dinner. Not sure if that’s one you like or if we just got lucky. To answer your question about where we stay, for longer visits we love home exchange in residential areas, but for shorter we like to find a Bed n Breakfast or interesting place relatively easy to explore from. Amsterdam sounds amazing, and embarrassingly I have never stayed there despite passing through Schipol airport 9 or 10 times ! Jordaan and the NDSM Warf are my favourite areas of Amsterdam. They’re so beautiful. Thanks for your post Alexis! I also really like the Jordaan and NDSM Wharf. Glad you got a chance to see them! Sarah, I’m excited to see your recs from nord. Let me know what you think of some of the places once you try them out. I’m super curious what you think about the Indonesian food! Thanks so much Sally! Glad you loved the guide. I want more people to read it, so they come to Amsterdam and get to see the awesome stuff beyond the Red Light District & Centre. De Pijp is so cute and I actually was there this weekend with some friends! Did you try Indonesian or Surinamese food!? Thank You so much! This is very helpful as I am going to Amsterdam in just a couple weeks. I haven’t booked a hotel yet so I will look in the Jordaan area and will be sure to check out the places you mentioned! Hi Karen. I’m heading to Budapest (and Amsterdam) this year, and was wondering whether you have the name of the restaurant you visited in Budapest that was a family friend’s favourite? That’s a great idea. I don’t’ think I could do it due to my rental, however I’ve increasingly really enjoyed Bed and Breakfasts as a place to stay. I love the care that the owners put into their guesthouse and fresh-made goodies. This is really cool! I’ve stayed in the centre on recent visits but I think this would give me the confidence to try further afield! I really miss Amsterdam shopping as well – from labels like Maison Scotch to the vintage choices – this style is right up my street!